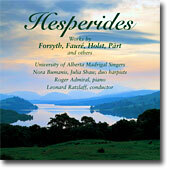 The Madrigal Singers draw from music from all periods and styles for their repertoire. Our recordings offer a wide range of examples of the music we study and perform, with a focus on music of the last two centuries. Included are several premiere recordings of works by Gavin Bryars and Jonathan Dove, as well as Canadian composers Allan Bevan, Eleanor Daley, Leonard Enns, Malcolm Forsyth, Ruth Watson Henderson and James Rolfe. 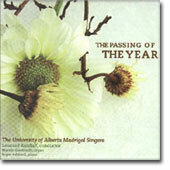 For ordering information and prices of any of our CD recordings, please contact us at mads@ualberta.ca. I: The Argument of his Book.. I. Ov'e, Lass, Il Bel Viso?